Cuba embargo: Obama’s motives are clear, but why does Raul Castro want to re-establish relations with the U.S.? Why Does Cuba Want to Re-establish Relations With the U.S.? Reuniting and it feels so good. 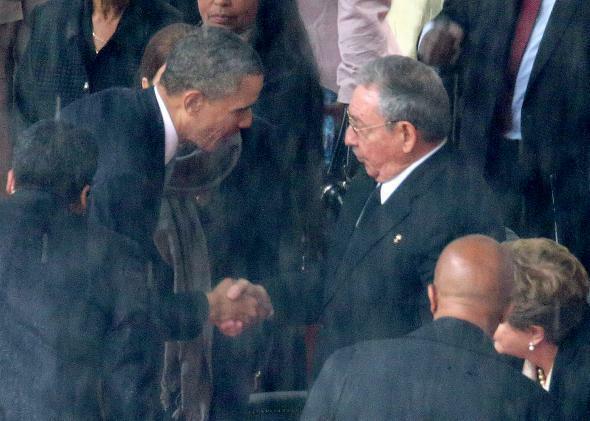 For the Obama administration, the motivation for today’s moves to normalize relations with Cuba is clear. The embargo against Cuba is increasingly unpopular, even in parts of the Cuban-American community that long supported it, and the president has been eager to find areas of both foreign and domestic policy where he can act without cooperation from Congress. But what’s driving this move on the Cuban side? There are two more looming factors guiding Raúl Castro’s thinking. One is that the 83-year-old leader plans to step down in 2018, meaning the country will not be governed by a Castro brother for the first time since 1959. This is likely to be a fraught transition for Cuba’s Communist Party. As part of what he calls the “systematic rejuvenation” of a party long led by aging veterans of the revolution, Castro last year replaced his 82-year-old first vice president with 52-year-old Miguel Díaz-Canel, making him the most likely successor. Díaz-Canel, though, is a relative unknown and won’t come into power with much credibility if the party can’t deliver economic growth. The modest economic reforms made thus far, including the loosening of restrictions on private property and independent businesses, haven’t done enough, delivering just 1.4 percent GDP growth this year due to what the country’s economy minister called “internal insufficiencies.” As Sweig put it, more dramatic steps “need to be implemented, and fast,” if Castro’s chosen successors are going to manage the transition. Add the Venezuela situation to the Castros’ advancing years and you can understand what’s driving Raúl toward a more accommodating stance. “It would be the height of poor planning to think that those two things could happen and the country would be OK,” Sabatini said. Another factor may be Fidel’s gradual retreat from politics. The 88-year-old, who is formally retired but thought to still be influential, makes only rare public appearances these days. (Fidel, or someone writing under his name, does still regularly weigh in on global affairs in columns for Cuba’s state newspaper.) While the official line from Havana is that there’s no daylight between the political positions of the two brothers, it does seem like the father of the revolution is either less of a factor than he used to be or has mellowed somewhat with age. Another X factor is presumed successor Díaz-Canel, who wasn’t even born at the time of the Cuban Revolution and kept pretty quiet since rising to his current position last year. “Díaz-Canel is somewhat of a mystery, but there is an element of a new generation that recognizes that the country has to change,” said Sabatini. All the same, speculation about massive political transformations is probably premature. “We haven’t even gone from Stalin to Khrushchev yet,” Sabatini said, comparing such speculation to Cold War-era “Kremlinology.” And in any case, Díaz-Canel certainly wouldn’t have been given his current position if Raúl didn’t see him as a loyal communist.